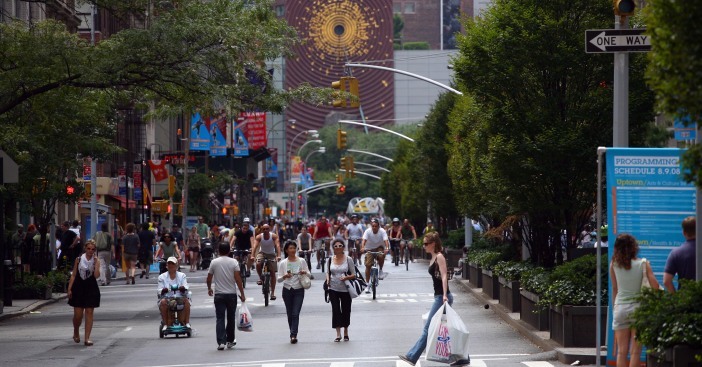 Manhattanites will take it to the "Summer Streets" once again this summer. And Brooklyn may get in on the action too. Congestion pricing may have died an ugly death in the state Assembly, but that hasn't stopped Mayor Bloomberg from doing all he can to reduce vehicle traffic in Manhattan. For the second summer in a row, the city will close a nearly 7-mile stretch of Manhattan roadways so that New Yorkers can do yoga, learn kickboxing, ride bikes, do cartwheels and exercise without fear of being run over by a runaway taxi. Starting at the Brooklyn Bridge, the closed roads with include Centre Street, Lafayette Street, Fourth and Park avenues and East 72nd Street until Central Park East. About 50,000 people took advantage of the traffic-free environment last year, but Bloomberg said he hopes even more will enjoy it this year now that new events are planned throughout the city. "This year, we’ve expanded the Summer Streets program to bring the fun to all five boroughs," Bloomberg said at a news conference today. "And we’ve put together a comprehensive list of more than 1,500 free summer events and activities throughout the City, so families can still enjoy what New York City has to offer during these difficult economic times." The program will take effect on the three summer Saturdays -- Aug 8th, 15th and 22nd -- from 7 am to 1 pm. Summer Streets will also be expanding to Willy B as plans for a similarly alliterative event "Williamsburg Walks" are under way.